I want to share with you my current face cleansing products. I recently picked up these Simple product which are working wonderfully on my face. I have heard so much good things about these products I had to give them a go myself. I use the micellar water every morning to freshness up my face and I use it again at night to remove my makeup. After I use the Micellar Cleansing Water I moisturise straight after with the Hydrating Light Moisturiser which is super soothing and dries in quite quick. I have been loving these so much I bought 4 more haha! You can watch my little talky video HERE where I talk more about these Simple face products. Wonderful products! 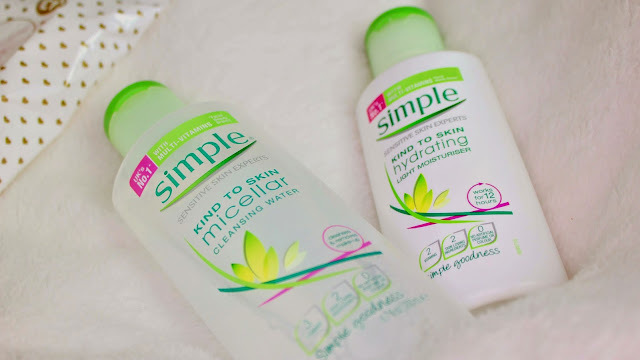 I have never heard of Simple but I can't wait to try them out!